you need the SportsTV Guide. If you own more than one TV, then you're running a sports-themed bar or restaurant. With over 8,000 TV stations broadcasting sports programming, how can you possibly know what sports are on TV each and every day? The answer is simple -- the SportsTV Guide. We let more than 30,000 bar and restaurant operators just like you know what's on for sports every single day. Use our guides to plan a complete day of live sports for your guests to enjoy, ensuring they stay longer and spend more money. Never again have your TVs tuned to endless reruns of SportsCenter by default. Flipping through channels or scrubbing through your TV's station guide is slow, cumbersome, and wasting valuable time. 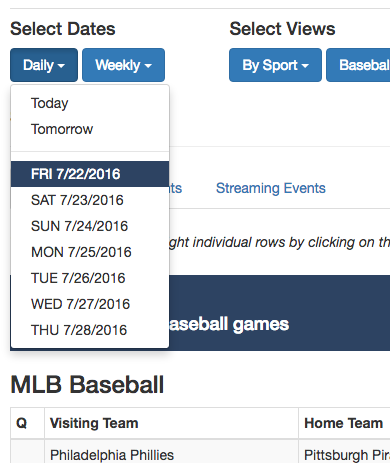 The SportsTV Guide makes searching for games easy. Everything you need to find the games your guests want to watch is at your fingertips. We do all the hard work, filtering the schedule by sport and date. Or you can use our Search function to find the team or event you want. Instantly. Every Sport, Game, and Channel. With the SportsTV Guide, you'll never have to tell a guest you're not sure if you can show a game or scramble for several minutes trying to find what station it's on. With the SportsTV Guide, you'll always know what games are on, at what times and on which stations. With the SportsTV Guide, we make it easier for you to know what's on for sports. Not only can you easily find out what events are broadcasting today and tomorrow, but you can also look ahead in the schedule to see what games are playing later this week or even later in the month. Only care about football? Baseball? Soccer? Hockey? Maybe your guests are more into Watersports, Cricket and Equestrian. No longer do you have to thumb your way through every single channel to find the event you and your guests care about. Anthology, Athletics, Australian Rules Football, Auto Racing, Automotive, Aviation, Baseball, Basketball, Billiards, BMX Racing, Boating, Body Building, Bowling, Boxing, Bullfighting, Cards, Cheerleading, Cricket, Curling, Cycling, Dancing, Darts, Extreme, Equestrian, Figure Skating, Fishing, Fitness, Football, Golf, Gymnastics, Hockey, Horse Racing, Hunting, Lacrosse, Martial Arts, Miscellaneous, Motorcycle Racing, Olympics, Outdoors, Pageant, Racket Sports, Rodeo, Rugby, Skating, Skiing, Soccer, Softball, Tennis, Track & Field, Triathlon, Volleyball, Watersports, Weight Lifting, Winter Sports, and Wrestling. The SportsTV Guide also allows for amazing customization. You can choose your channel providers, so your Guide displays only the games and events you have access, too. You can also choose your favorite teams, highlighting them in bold fonts and bringing the listing to the top of your Guide. With the SportsTV Guide, you'll never have to tell a guest you're not sure if you can show a game or scramble for several minutes trying to find what station it's on. With the SportsTV Guide, you'll always know what games are on, at what times and on which stations. 4. Click "Go To My Guide" that's it! 2. Click "View Your Guide." 3. Click "Print Listing" and preview your guide. 5. Click "print" - And that's it! Already have an account? Get a new link instantly, click the button below.